(CBS) OKLAHOMA CITY - An Australian baseball player out for a jog in an Oklahoma neighborhood was shot and killed last week by three "bored" teenagers who decided to kill someone for fun, police said. Christopher Lane, who was visiting the town of Duncan where his girlfriend and her family live, had passed a home where the boys were staying and that apparently led to him being gunned down at random, Police Chief Danny Ford said Monday. A 17-year-old in the group has given a detailed confession to police, but investigators haven't found the weapon used in last week's shooting, Ford said. That teen and the others - ages 15 and 16 - remain in custody, and Ford said the district attorney is expected to file first-degree murder charges Tuesday. It wasn't known if the three will be charged as adults or juveniles. They are scheduled to appear in court Tuesday afternoon. "They saw Christopher go by, and one of them said: 'There's our target,'" Ford said. "The boy who has talked to us said, 'We were bored and didn't have anything to do, so we decided to kill somebody.'" He said they followed the 22-year-old Lane, a student from Melbourne attending college on a baseball scholarship, in a car and shot him in the back before driving off. Ford told the television station KOCO in Oklahoma City that one of the teens said they shot Lane for "the fun of it." Lane's father, Peter Lane, told media in Australia: "There's not gonna be any good to come out of this cause it was just so senseless." Lane's American girlfriend also is struggling with the incident. "He didn't deserve any of this," Lane's girlfriend, Sarah Harper, told the Australian Broadcasting Corp. "It's heartbreaking that it was such a random choice those guys made that drastically altered so many lives in the process." Witnesses rushed to help Lane after hearing a shot Friday and seeing him stagger and collapse on a road in Duncan, a south-central Oklahoma town of about 24,000 residents. "He was face down on the ground and he was shot in the back with a .22 revolver," builder Richard Rhodes told Australian broadcasters near a roadside memorial at the scene. "I had another lady stop and we tried CPR on him. And he passed away right here." Harper said she and Lane had only returned to the United States from Australia last week. Lane attended East Central University in Ada, about 85 miles west of Duncan. He started 14 games at catcher last year and was entering his senior year. 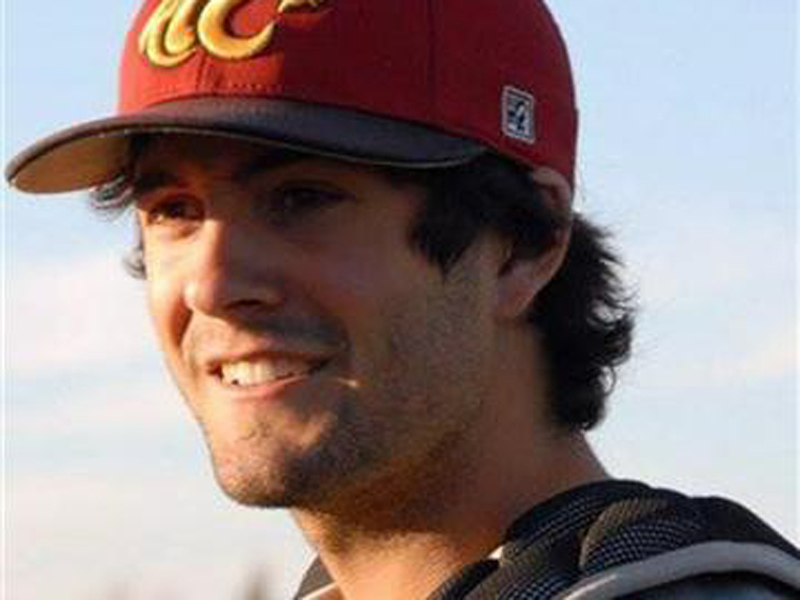 "He was an absolute joy to coach," baseball coach Dino Rosato said in a statement issued by the school. "Chris was an extremely well-respected teammate. ... He set a great example for all of his teammates, but more importantly for the younger players. He was a mature student-athlete who his teammates could look to for advice and support." Peter Lane told Australian broadcasters there was no explanation for his son's death. Ford wouldn't say how many times Christopher Lane was shot. Autopsy results are pending. One of the suspect's mothers told CBS affiliate KWTV in Oklahoma City her son and his friends were in a "wannabe gang." Police told KWTV the suspects may have killed an animal prior to shooting Lane, and that they planned on killing more people.